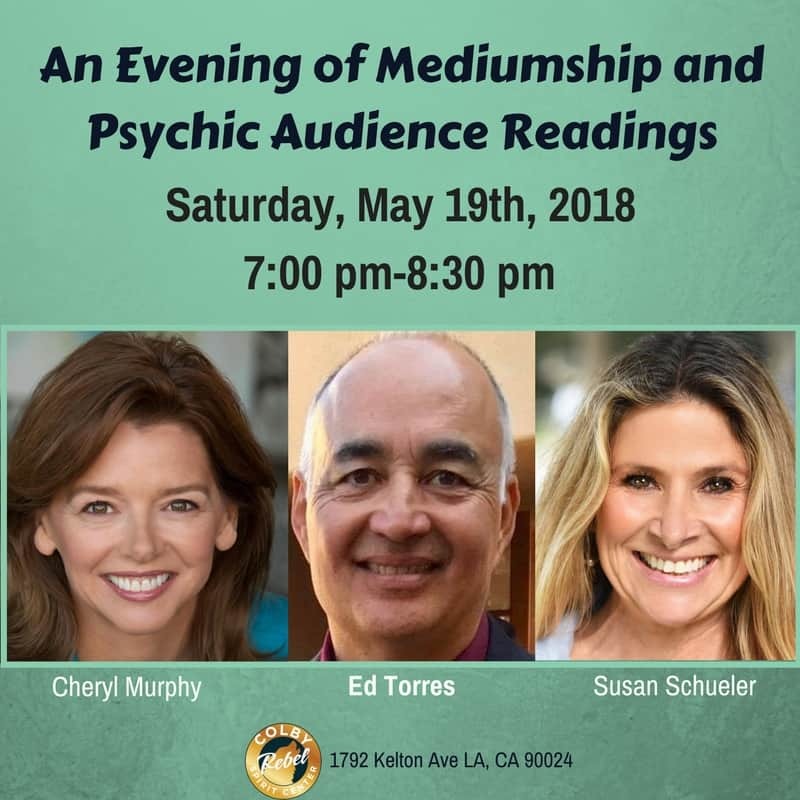 Join psychic mediums Susan Schueler, Ed Torres and Cheryl Murphy for an evening of messages from your loved ones on the other side. During this healing event you will witness first hand that love never dies and how your loved ones in Spirit are always around. Susan Schueler: Susan believes in the importance of improving her gift as a psychic medium and attends Arthur Findlay College in England several times a year. One of the reasons Susan values learning is because she was a high school English teacher for almost 25 years. She holds her BA in English Literature and Theater and her MA in Literature and Women’s Studies. She has spent years in spiritual development circles, where she continues to find new ways to communicate with the Spirit world and improve her natural psychic gifts. Susan Schueler is an ethical and accurate psychic medium with Shay Parker’s Best American Psychics, and The Lisa Williams’ International School of Spiritual Development. Ed Torres: At a very early age Ed was aware of “something,” as he used to call it. It was not until later in life that he realized it had a more formal name, now more commonly referred to as “intuition” or being intuitive. Ed experiened 3 deaths at an early age, one of them being his older brother and this was catastrophic for him. Consequently, when he began reconnecting with the spirit world, it all came back to Ed in a very natural way. He always felt comfortable with the idea of the afterlife. Aside from his psychic and mediumship work, Ed is also a Reiki Master and Karuna Reiki Master.